The use of the horse-drawn transportation was probably designed both to entertain and to emphasize the need to conserve gasoline. Scrap drives — wartime versions of today’s “recycling” — were important sources of metal and other materials to be melted and reformed into ships, tanks, guns, ammunition, and other pieces of weaponry. During the last three years of World War II, Ridgefielders collected 539,262 pounds of iron and steel — nearly 270 tons. They also donated 12,644 pounds of waste fats from kitchens; 48,925 pounds of tin (mostly cans); 4,000 pounds of rags; and 292,975 pounds of paper. 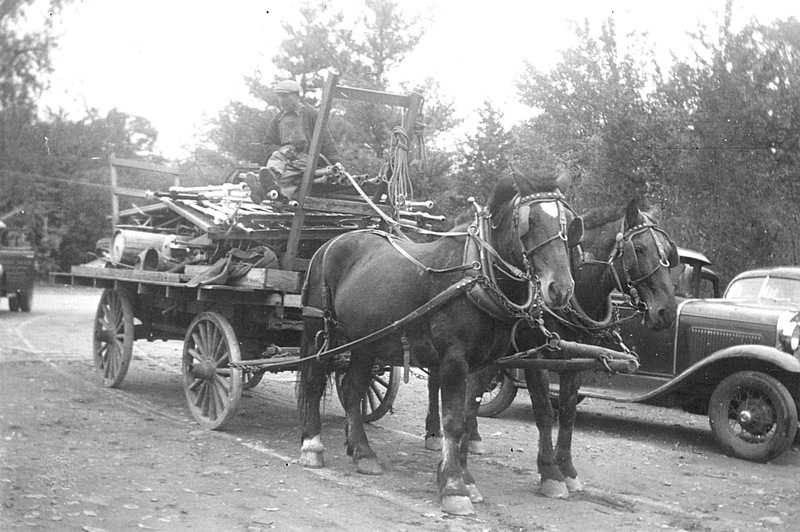 As noted in an earlier posting on Old Ridgefield, the town’s scrap metal-collecting efforts gained national attention when the Pulitzer Prize-winning columnist Westbrook Pegler, who lived on Old Stagecoach Road, was photographed in Life magazine, removing his car’s bumper in front of town hall to contribute to the war effort.